Ars in fabula, a grant awarded every year to “young, unpublished illustrators under thirty who have been already selected for the Illustrators Exhibition,” was assigned to Parisian Jean Mallard (b. 1997), who impressed the jury with his dreamlike and delicate style. The BolognaRagazzi Award (BRAW), a highly regarded award conferred just before the BCBF, honors the best productions presented by publishers, illustrators, or agents exhibiting at the BCBF. Every year, the BRAW is awarded in three main categories—Fiction, Non-Fiction, and Opera Prima (a prize for first-time illustrators and authors)­—as well as one or two special categories (this year they were Architecture and Design and a special prize, Books and Seeds). French artists dominated the scene, followed by South Korea. All in all, this year’s BRAWs attest to the creative potential of scientific and technical publications, currently on a path towards illustrative embellishment that had not been central to them until now. In the Non-Fiction category, the winner was a Ukrainian duet of books, Loudly Softly in a Whisper and I See That, by Romana Romayshyn and Andriy Lesiv (The Old Lion Publishing House, 2017), notable for their unusual infographic approach. But science-inspired stories are well represented in the Fiction category as well, for example by the Finnish book, Tuulen vuosi, by Hanna Konola (Etana Editions, 2017), receiver of a special mention, which tells the adventures of the winds as it passes through the four seasons. 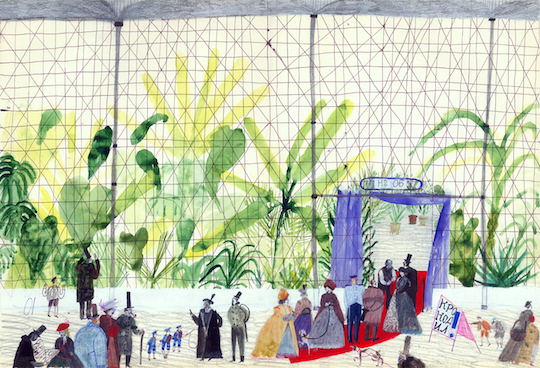 The winner in the Art, Architecture and Design special section was a markedly architectural book (Aurelién Debat, Cabanes, Editions des Grandes Personnes, 2017), but a special mention was conferred on My Museum by Joanne Liu (Prestel Verlag, 2017), for its enchanting approach to art as seen through children’s eyes. Finally, the Bologna Prize Best Children’s Publishers of the Year (BOP), which acknowledges the most significant publishers in each of the six areas of the world (Africa, Central and South America, North America, Asia, Europe, and Oceania), went to: Jacana Media, South Africa; Fukuinkan Shoten Publishers, Japan; Ediciones Tecolote, Mexico; Dwie Siostry Publishers, Poland; Editions d’eux, Canada; and OneTree House, New Zealand. One can take many different itineraries among the stands at the BCBF. I will try to list five trends that have emerged from all the conversations I had and the impressions I gathered. We are in a new golden age for biographies—of explorers, especially, but also scientists and athletes. Among them, women are definitely in the forefront, riding the wave launched by Rebel Girls. These books have found success even in a world that is, alas, still illiterate when it comes to children’s literature. Although it never completely disappeared, the fascination for the past is definitely back. Old heroes and prominent writers that had temporarily faded from view make a comeback in new, carefully curated editions. Korea, Japan, and Taiwan—perhaps following the centrality of China as the BCBF’s guest of honor this year—proudly showed their fascinating works, helped out by the carefully rendered English translations of the works on display. The new pavilions, spacious and bright, confirm that the reality of these works is in fact much more interesting and multifaceted than the fraction of them that slips through to the West. Renowned authors play a pivotal role in promoting the lesser-known artists whose illustrations nonetheless enchant because of their intensity, the glimpses of landscapes that resemble visual poetry, and the attention paid to the books for the littlest ones, remarkable for the care and fascination with daily life and common objects. It is not surprising that the New Horizons BRAW was awarded to a South Korean artist, Bae Yoo Jeong for Tree Dancing (Bandal, 2017). Human representation has acquired a renewed central position, previously abdicated in favor of animals and such. Many new texts focus on the child’s daily life, which I think is an extremely interesting and significant development. China made a great effort to promote itself to the world. Aware of the cultural distance that probably—and unjustly­—relegates Chinese literature to a state of almost-global oblivion, China showcased its illustrators’ most interesting works in an easily accessible space and generously opened to the public the area dedicated to publishers, previously unreachable because of a sort of “Great wall.” The beloved stories of an uninterrupted folkloric tradition stretching back over millennia were given prominence, as well as new styles recounting contemporary China, its unexplored natural and urban spaces, new ideas and stories of relationships, play and irony. Maria Polita is a mom, teacher and an avid reader. Her academic interests include Italian literature and grammar and, increasingly, their intersection with children’s literature. She blogs about children’s books at scaffalebasso.it.